Only a stone throw away from the Nathional Institute for the blind nothing canprepare you for the unique sensory experience that is Dans Le Noir. It workslike this; you sign in at the waiting area, put all phones and anything elsethat might emit light in a locker, then you select a coloured menu that correspondswith a surprise. The content of menu will only be revealed at the end of thenight. Following storing of items in lockers you will be introduced to yourhost for the evening who will lead your guest(s) through three sets of velvetdrapes to your table in a dark room. You literally can’t see anything. Leavingyou to rely wholly on the remaining four senses and the blind host assigned toyou. You’ve never tasted food like this before, that’s for sure. And becauseyou can’t see who’s next to you, everyday judgments and fears are removed and touchingyour neighbours becomes irresistible. Dans Le Noir is a memorable, pleasant andunforgettable experience that everyone should try at least once. The chefsconstantly update the menus in order to keep the experience fresh and thereforerepeat dinners will be permitted to broaden their taste horizons by trying avariety of other surprise menus. 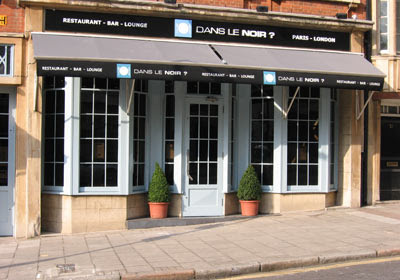 Dans Le Noir 30-31 Clerkenwell Green, London, EC1R 0DU.